When three large government departments merged to create the Australian Department of Human Services, it took the new department almost three years to migrate to Windows 7. Having gone through those “three hard years,” the IT team was determined not to fall behind again, says Mike Brett, the department’s general manager for information communication technology infrastructure. Not only did the department start its Windows 10 migration as soon as the operating system came out, but it’s also committed to adopting new releases of Windows 10 as they come along. “It’s our intention not to get out of date and fall behind again, so we don’t have to have a big-bang Windows upgrade again,” says Brett. “We’re keen to stay current — especially where there’s an advantage to moving forward — and we’re keen not to have to do that kind of remediation again. We want to stay ahead of the game rather than playing catch-up. Updating Windows regularly might be less disruptive, but moving to this model is itself a big change. “On the one hand, organizations see this as potentially disruptive. At the same time, they say disruption can be good if it gets them out of the problems of the past,” Niehaus says. Craig Dewar, senior director for commercial Windows at Microsoft, estimates that most customers that are adopting Windows as a Service have some 90% of their PCs running the Current Branch for Business (CBB, which Microsoft is renaming the Semi-Annual Channel, because it will now come out twice a year, on a fixed schedule to match Office and System Center). “They typically have something like 9% of their machines on the latest release, and then 1% on Insider builds” (referring to the Insider for Business program). “Enterprises want to start piloting a new release as soon it comes out, starting with the IT organization, to see how productivity and line-of-business apps and devices work with it,” Niehaus notes. Typically, customers decide the new releases are ready for broad deployment after four months, he says. 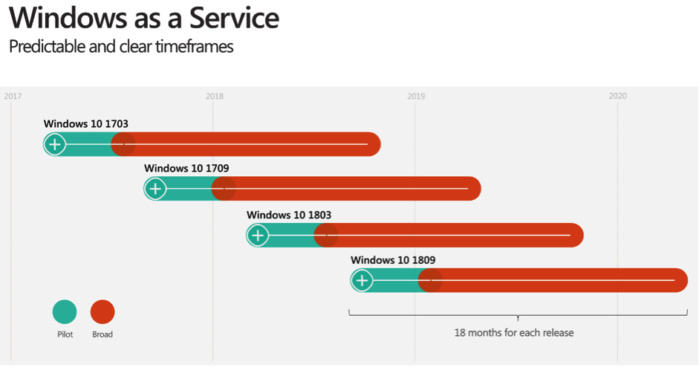 The support life cycle for Windows 10 pushes businesses in this direction. With Windows releases now coming in March and September every year, the rather complicated formula of servicing for the two most recent CBB releases plus a 60 days’ grace period becomes a much clearer 18 months of support. Kleynhans cautions against trying to use the Long Term Servicing Branch (LTSB, soon to be known as the Long Term Servicing Channel) as a way to avoid updating Windows 10. LTSB releases come out every two to three years and are supported for ten years (much longer than other branches), but this branch is intended only for specialized systems that perform a single important task and need stability more than the latest features. LTSB devices only get quality updates, they can’t run Edge or Windows Store apps (including the inbox apps such as Mail and Cortana), and you can only use an LTSB release on PCs with the CPUs that were shipping when that branch was released. “For a lot of companies, rolling out LTSB beyond the relatively few targets in their environment where it’s required will actually create more problems with keeping up to date,” he says. “The problem is that LTSB is only certified for things that were shipping the day LTSB shipped. Any new processors, potentially any new versions of applications — for anything that comes out after LTSB ships — there's the potential that it won’t work with that LTSB and you’ll have to move to a new LTSB. You might end up having to update to a new LTSB every year. How is that better? Outside of a very narrow target, LTSB could be much harder to manage in your environment long term than just sticking with CBB. The message seems to have gotten through: The most recent survey that Microsoft did of commercial Windows customers showed only a single-digit percentage looking at LTSB for broad deployment, according to Niehaus. As they shift the way they handle deploying Windows, many organizations are also taking the opportunity to manage those Windows PCs rather differently — more like the BYOD phones and tablets employees have been adopting than the desktop PCs of old, especially as more two-in-one devices such as the Surface Pro show up in the enterprise. Some customers experimented with this approach but there hadn’t been a significant shift in PC management until Windows 10 built in an MDM client that adds new policy options with each release. According to a recent survey by analysts CCS Insight, this switch will bring desktop and mobile management teams into a single group inside IT organizations. Among respondents to the survey, 83% said that operational convergence would happen within three years, and 44% said that would happen within 12 months. That also means moving from MDM tools designed for phones to services such as Microsoft Intune and EMS that can manage both phones and PCs, noted Nicholas McQuire, vice president of enterprise research at CCS Insight.